Moving stress + running errands our last day in Cow Town + 50% off sale at Value Village facilitated a bit of a splurge on vintage children’s patterns, I fear. How can you resist a bit of retail therapy for a quarter apiece? 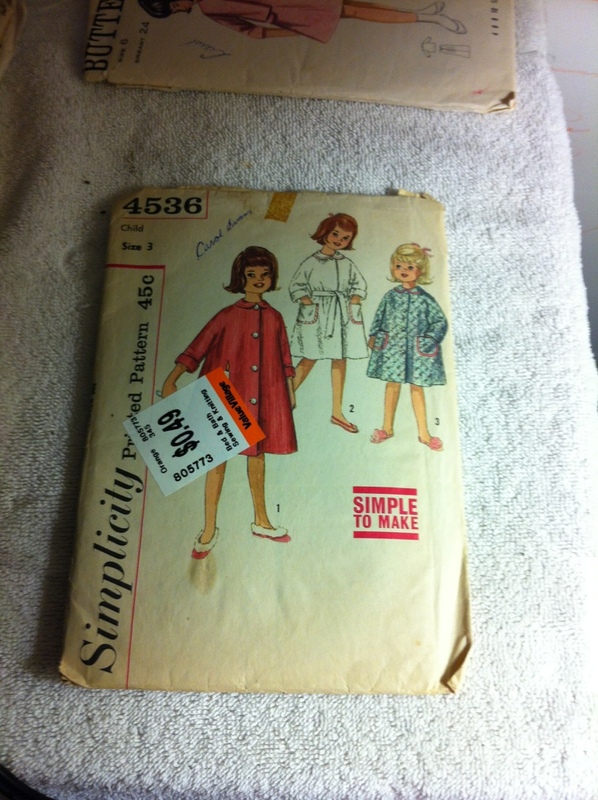 The patterns range in size from 4 to 6X, and all seem to have been intended for wear by a girl named Carol Evans, who I presume was a vampire trapped eternally in a child’s body, since the patterns range in vintage from 50s through 70s. 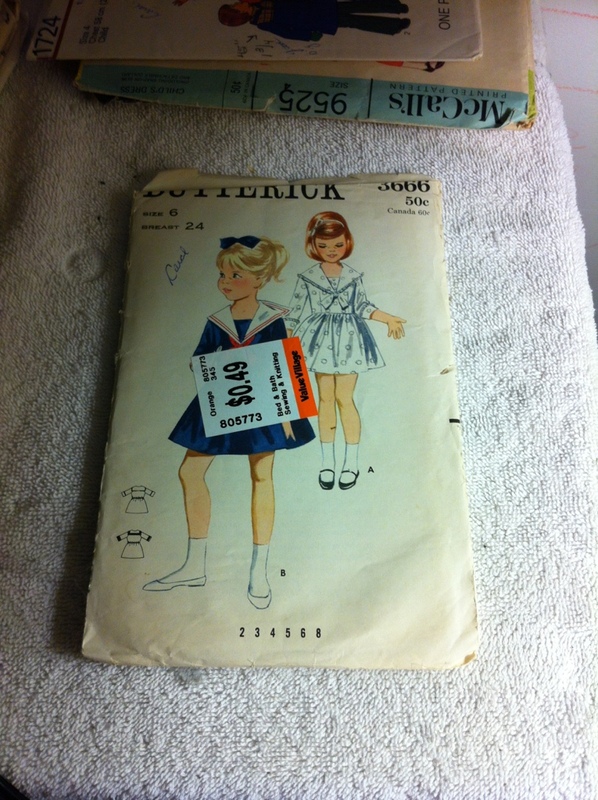 Or they might have been collected more recently by a mom-stitcher with a thing for vintage patterns, not unlike myself. But really, I think it’s the vampire thing. This fifties housecoat just may be the child’s version of this pattern, which Peter and Cathy rehabilitated so stunningly into an “Opera Coat.” I’m going to assume that our little vampire was at least as capable of turning something so drab and basic into something luxe and glamorous as Cathy is. 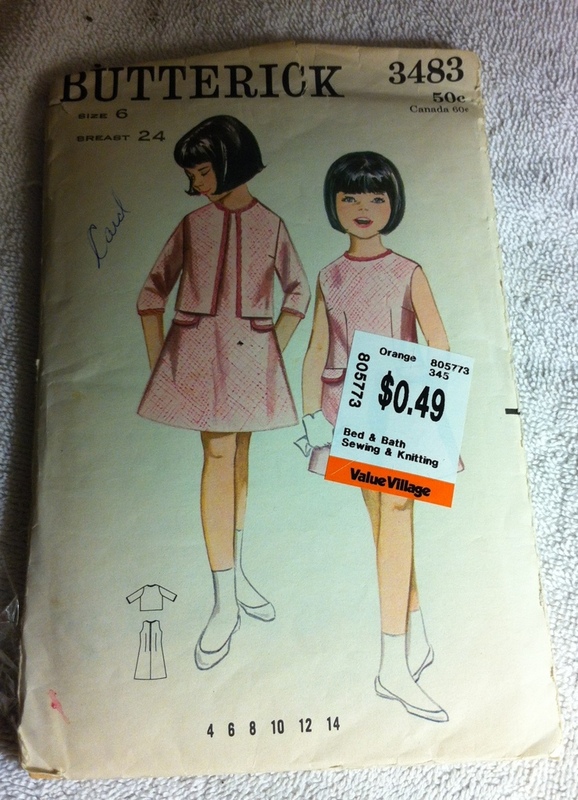 This might just be the quintessential fifties little girl dress. According to this website, it’s from 1954, as is the preceding housecoat. Also, I love the little capelet. Every vampire (child) needs a capelet. Not to mention plenty of variations on a dress, for when she gets blood on it. Also, those of you who did time in Vampire: The Masquerade, dig the black satin version with the rose. Something about the white version of this sweet little sailor dress just makes me squee. Presumably this had a similar effect on Carol Evans. Or possibly she ran away to sea to hide her lack of aging. You have to keep moving when you’re a vampire child. 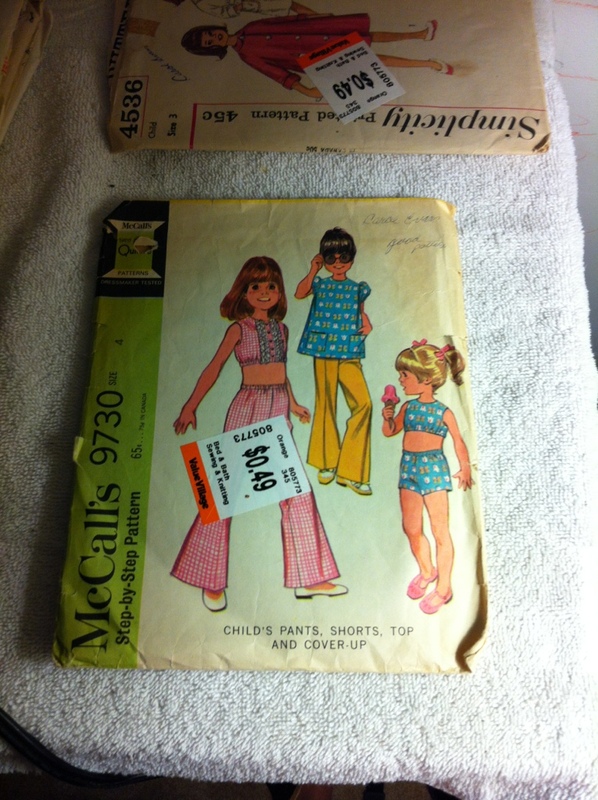 These two McCall’s patterns fascinate me, not so much for their contents as their style. I had instantly pegged the dress as sixties (based on the illustration style, the dress itself is such a classic I think with minor hem-length variations it would look at home in any decade since 1900. Possibly 1850.) The pants wardrobe, on the other hand, I had pegged as classic 70s. The fashions, the art, the bell-bottoms, the gingham. Then I checked the dates on both patterns. The 60s one is indeed earlier—1968. But the “70s” pattern is 1969. I kind of feel like I’ve captured the cusp of a decade in pattern form—a snapshot of the transition from one style regime to another. Especially since both are by the same company. As for Carol, well, they both obviously cater to her need to appear childlike and innocent to manipulate the adult humans around her. Can’t have anyone suspecting, after all. I love the Jackie O/Chanel. I even love the haircut on the illustration. 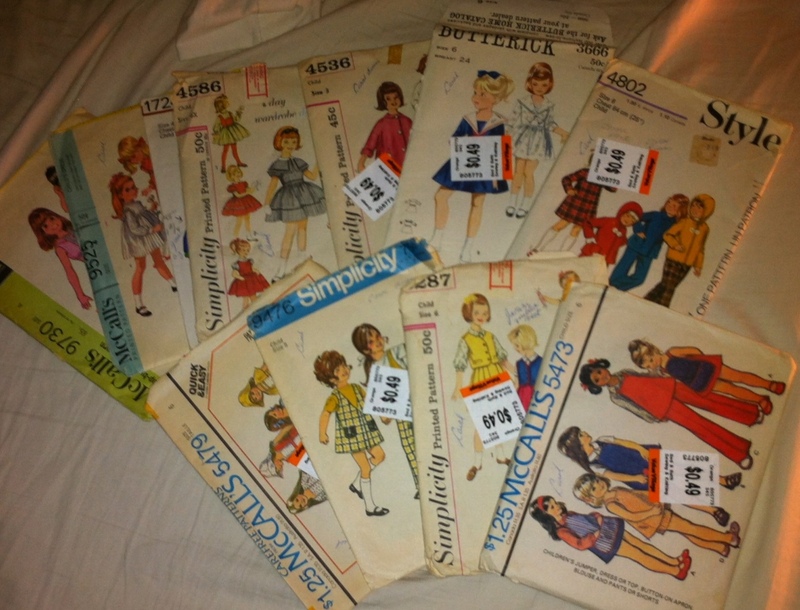 I had at least a few of those dresses growing up (mostly made by my mother)… it wasn’t until sometime in Gr. 2 that my reluctance to display my underwear while climbing and tumbling managed to get me to consider wearing something other than dresses to school. My first thought was that it was one of those incredibly prolific mothers who has multiple children over the course of thirty years, and therefore bought patterns from multiple decades…I’m not sure which is creepier, but I’ think I prefer vampire girl myself. I can totally see Claudia preferring to dress maturely if she hadn’t been burned alive. Or perhaps “Carol” was a figment of a schizophrenic delusion who never ages, like the little girl in “A Beautiful Mind”…. you should be careful that she wasn’t turned to dust and is lurking in the patterns waiting for a drop of blood from an errant pin to recorporialize her. 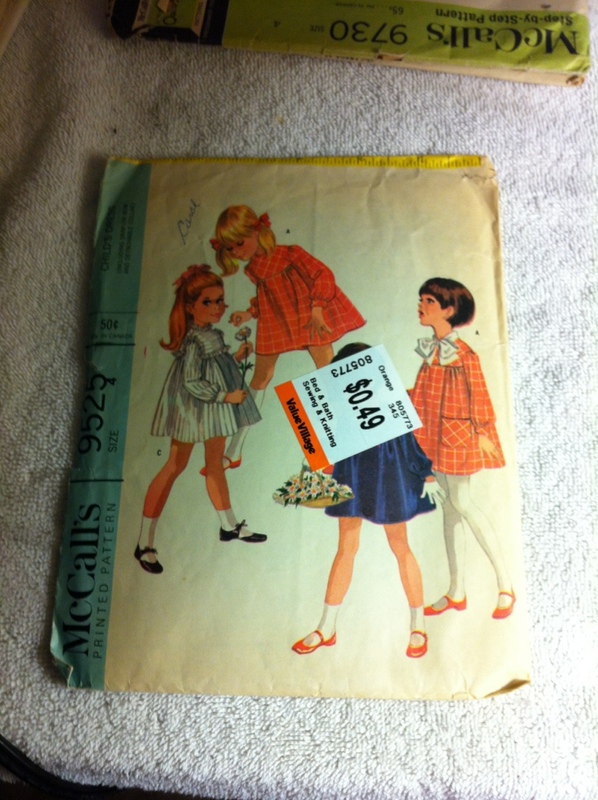 I can’t believe it vintage patterns for quarter a piece I would that is crazy. I’m glad that you got some at such a wonderful price. I love the patterns that you found I can’t believe that you came across such a sale. Super cool patterns… Have been following Marlo Thomas’ styles recently; here’s a page from the interwebs. Great classic 70s stylings! Great patterns! Don’t you wish Val. Vill. would place their price tags more thoughtfully? I have tried to remove their stickers from pattern envelopes to no avail! Happy Sewing! Most of these patterns look like the clothes my mother made for me in the mid sixties through early ’70s. 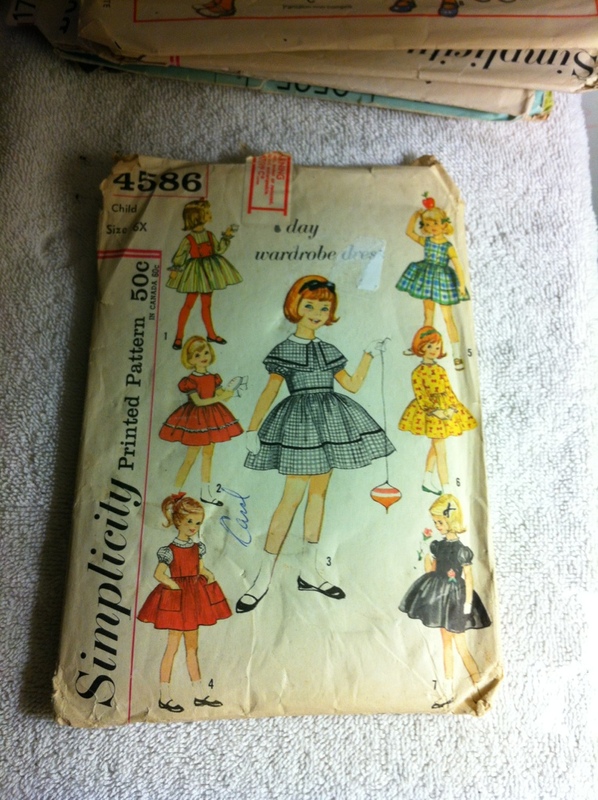 As I remember, the pattern companies used to keep the same styles for quite awhile. A fabric store could easily have the same patterns from several years, especially in the bargain bin. My guess is that Carol bought them all within a few years, it’s just that some were older ‘bargain’ patterns at the time. Kids fashions did not change so quickly back then, and also there was a lot of overlap in styles as you can see by that pants pattern. Real people didn’t necessarily look like tv show characters (except maybe in the 70s! ).